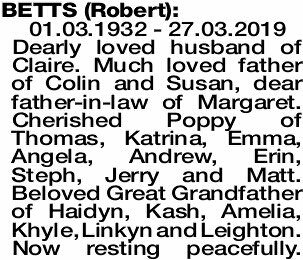 01.03.1932 - 27.03.2019 Dearly loved husband of Claire. 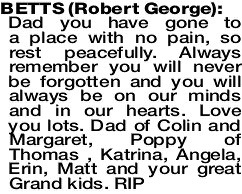 Much loved father of Colin and Susan, dear father-in-law of Margaret. Cherished Poppy of Thomas, Katrina, Emma, Angela, Andrew, Erin, Steph, Jerry and Matt. Beloved Great Grandfather of Haidyn, Kash, Amelia, Khyle, Linkyn and Leighton. Now resting peacefully. 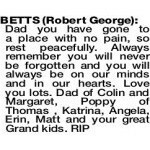 The Funeral Cortege for Mr Robert George Betts of Kewdale will arrive at the main entrance of KARRAKATTA Cemetery, Railway Road, Karrakatta at 10.30am THURSDAY (4.4.2019) for a Cremation Service. 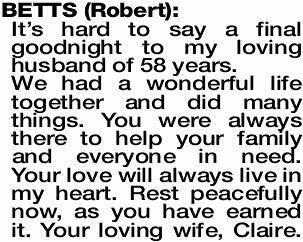 It's hard to say a final goodnight to my loving husband of 58 years. We had a wonderful life together and did many things. You were always there to help your family and everyone in need. Your love will always live in my heart. Rest peacefully now, as you have earned it. Your loving wife, Claire. 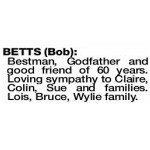 BETTS BOB Bestman, Godfather and good friend of 60 years. Loving sympathy to Claire, Colin, Sue and families. Lois, Bruce, Wylie family. 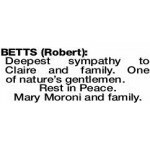 Deepest sympathy to Claire and family. One of nature's gentlemen. Rest in Peace. Mary Moroni and family. Farewell to our good friend Bob. Sorely missed. 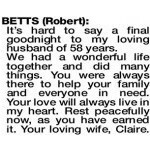 Deepest sympathy to Claire and family.